Crockpot Picadillo + bonus Picadillo Pie with Cheesy Cornbread! I can't remember the first time I heard the word Picadillo. I'm a huge fan of Latin American food and am always checking out cookbooks and recipes to learn more, so most likely saw the term on one of my explorations. The basic definition is a traditional Latin-American dish that contains ground meat, tomatoes, vegetables, and other regional ingredients, used as a filling, for example in tacos. I've seen it labelled as Cuban, Spanish and Latin-American and the sheer variety of ingredients used and ways they are combined is mind-boggling. Some are very tomato-y, more like a Sloppy Joe. Some us very little tomato. Some are spicy, some are not. The two ingredients I used to see in every recipe were pimento stuffed olives and raisins. While most seem to still include the olives, the raisins have disappeared in many. I like them included. It is a really subtle flavour note, but one that makes it taste more authentic to me. With the slow cooker style of cooking it is so blended you don't even realize raisins are in it. I perused about six recipes to get ideas and took what I liked from each in terms of proportions and ingredients. This is a great way to create something new if you're like me and palette challenged. Oh that I could take a taste of a dish and list all the ingredients or know the one thing that needed adding. Instead I have learned what I like by trial and error. To create something "new", I usually start with a few recipes of a similar vein. If you do this enough, you begin to know what will you like. This recipe is super easy. You just brown the hamburger, then dump it all in the crockpot. 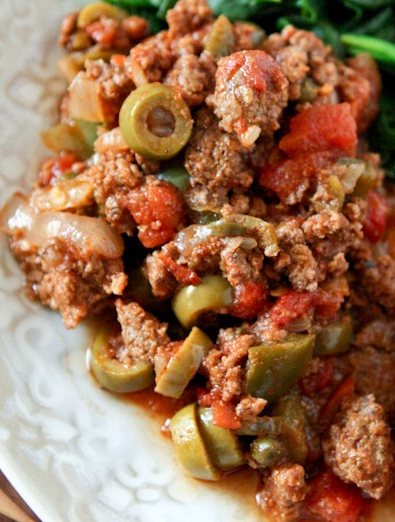 Stir well, then let it cook, You can serve the Picadillo with (or on) rice, wrapped up in tortillas, as a filling for stuffed peppers or tacos, tucked into a Spanish Omelet, or paired with spicy cheese in Quesadillas. Another option is to make a Picadillo pie topped with biscuits, cornbread or Polenta. I used this last option and topped it with my favourite cornbread recipe as I couldn't find a quick mix, but there is no end to ways you can use this versatile dish. Brown extra lean hamburger in non-stick skillet until all pink is gone. Drain. Place in crockpot with the rest of the ingredients. Stir well, cook on low for 4 - 5 hours. Remove bay leaves and serve in your favourite way. 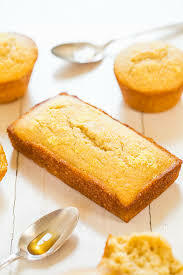 1 Corn muffin or corn bread mix or your favourite recipe. Preheat oven to 350 degrees. Prepare a 9 x 13 baking dish (oil, spray or butter). Place the Picadillo in the dish and spread in an even layer. Prepare your cornbread mix (home or commercial), adding the grated cheese to the dry mix before your add the liquid ingredients. Drizzle in a thin layer over the top. Gently even with the back of a large spoon. Place in oven and back for 30 minutes or until edges are slightly brown and cornbread is firm. Do not overcook. Mix all dry ingredients. If using for above recipe add your cheese here. Mix your egg, milk and oil. Add to the dry ingredients and stir gently until well combined. See above to use for Picadillo Pie. If you want to make muffins or a loaf of cornbread, prepare your muffin cups or loaf pan with Pam or butter. Spoon into muffin cups or loaf pan (for muffins 10-12 depending on size). Bake until done - about 20 minutes. Should be firm and edges a slight touch of brown.